Context: Langerhans cell histiocytosis (LCH) is a rare atypical cellular disorder characterized by clonal proliferation of Langerhans cells leading to myriad clinical presentations and highly variable outcomes. There is a paucity of Indian studies on this subject. Aim: To present the experience of management of LCH at a single institution. Settings and Design: This is a retrospective observational study of patients with LCH who presented at the Tata Memorial Hospital between January 1987 and December 2002. Materials and Methods: Fifty-two patients with LCH were treated in the study period. Due to the long observation period and variability in diagnostic and therapeutic protocols, the patients were risk-stratified based on present criteria. The disease pattern, management approaches and treatment outcomes of patients were recorded. Statistical Analysis Used: Statistical analyses were done using Student's 't' test, test for proportion and survival estimates based on the Kaplan-Meier method. Results: The median age at presentation was 3 years and more than 48% of the patients had Group I disease. Skeleton, skin and lymphoreticular system were the commonly involved organs. Majority (80%) required some form of therapy. The projected overall survival is 63% at 10 years and mean survival is 118 months. Seventeen percent of surviving patients developed long-term sequelae. Conclusions: The clinico-biologic profile of LCH patients in India is largely similar to international patterns except a higher incidence of lymphoreticular involvement. Majority of the patients respond favorably to therapy and have a good outcome, except a subset of Group I patients who warrant enrolment in clinical trials with innovative therapeutic strategies to improve outcome. Background : Seroma formation after mastectomy typically delays recovery and adds to morbidity. Aims : This retrospective review was undertaken to identify factors which predict development of seroma after mastectomy for breast cancer patients. Setting and Design : 119 consecutive patients intended for mastectomy for the treatment of primary breast cancer were included. Factors taken into consideration were epidemiological, peri-operative in nature and those related to wound drainage output. Materials and Methods : Total mastectomy was performed and axillary sampling was taken. All patients were reviewed within two weeks after leaving hospital, unless seroma formation was detected before discharge. The diagnosis of seroma was made clinically when a collection was detected beneath the skin flaps. Statistical Analysis Used : Student's t test was used with continuous variables and the X 2 test for categorical situations. Fisher's exact test was applied when small numbers were encountered. A two-tailed test of P<0.05 was considered significant. Univariate analyses were performed. Results : The incidence of seroma formation was eight per cent. Five factors were identified to be significantly related to seroma formation: i) age over 45 years; ii) hypertension; iii) total drainage output exceeding 500 ml in the first three postoperative days; iv) drainage for more than eight days. Immediate breast reconstruction prevents the formation of seroma. Conclusion : The presence of hypertension in a patient over 45 years should alert the surgeon to possible seroma formation, particularly when the post-operative drainage exceeded 500 ml in the first three days. Appropriate preventive measures should then be implemented. Orbital rhabdomyosarcoma is the most common orbital malignancy of childhood with the common presentation of rapidly evolving unilateral proptosis. We studied six patients who were diagnosed and treated for rhabdomyosarcoma between January 1999 and June 2004. The age of the patients ranged from 4 to 29 years. 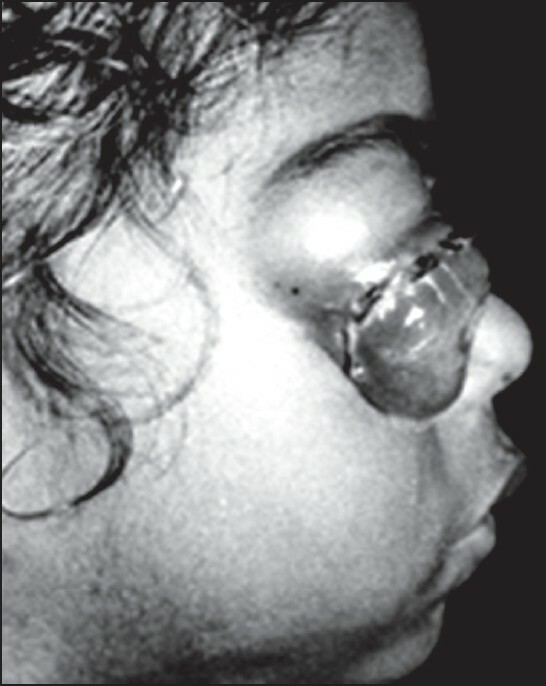 Four patients presented with acute onset proptosis associated with signs of inflammation, mimicking orbital cellulitis. One patient presented with lid mass. Another patient presented with a soft, blind eye that was pushed superotemporally by a large inflammed, vascularised mass. Embryonal rhabdomyosarcoma was the commonest histopathological type in our series found in five patients. One patient was completely cured with chemotherapy alone whereas two patients were treated with a combination of chemotherapy and radiotherapy. Three patients in our series required exenteration. Purpose : To assess the efficacy and safety of high dose thalidomide therapy for longer duration of time in relapsed or refractory Multiple Myeloma (MM) patients. 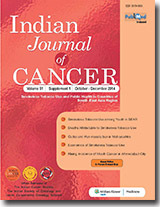 Materials and Methods : Twelve relapsed/refractory MM patients (7 Males, 5 Females), who received thalidomide for more than 2 years were selected from the Out Patient Department of Institute Rotary Cancer Hospital (IRCH), AIIMS, India. Patients received thalidomide beginning at a dose of 200 mg/day with fortnightly increment to a maximum dose of 800 mg/day. Patients were assessed for response on the basis of M proteins (MP), bone marrow biopsy with touch preparation and skeletal X-rays. Results : Nine patients tolerated a maximum dose of 800 mg/day whereas three patients were given 600 mg/day. All patients showed ≥ 25-50% decline in serum /urine M proteins. Complete response/ near complete response was seen in 50%, partial response in 17% and minimal response (SD) in 34% patients. 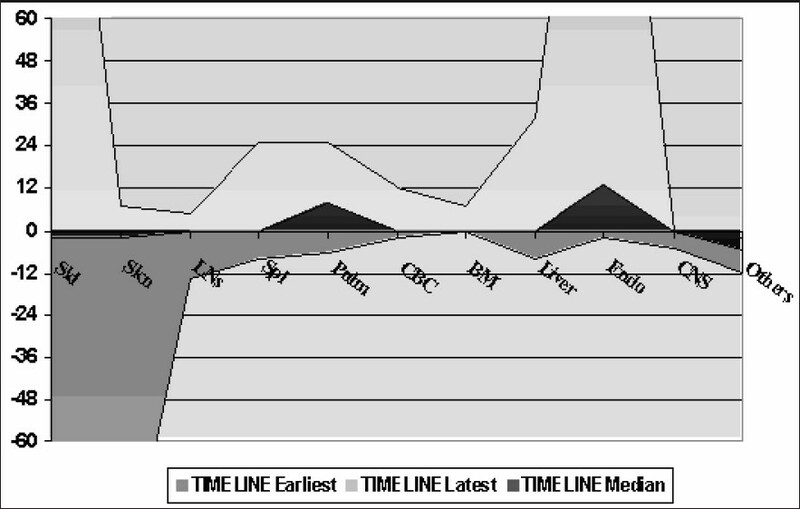 Median duration of thalidomide therapy was 47 months (range 29-60 months). Currently 11 patients are alive. Toxicity : Varying degree of constipation and sedation were seen universally. One patient had DVT, which responded to anti-coagulant therapy. Other toxic effects included infections, skin reactions. There was no toxic death. Conclusion : long-term use of thalidomide is safe, effective and feasible. We feel that this is one of few reports describing safety and efficacy of long-term thalidomide in relapsed and refractory MM. Pancreatic cancer is one of the most lethal human cancers and continues to be a major unsolved health problem as we enter the 21st century. This is the case despite advances in imaging technology and surgical management. Indeed, 80-90% of pancreatic cancers are diagnosed either at the locally advanced stage or metastatic stage. Cutaneous metastases originating from pancreatic cancer are relatively rare. The most common site of cutaneous metastasis is the umbilicus, and it is known as the Sister Joseph's nodule. Very few patients have been reported with cutaneous lesions disclosing pancreatic carcinoma at sites other than the umbilical area. 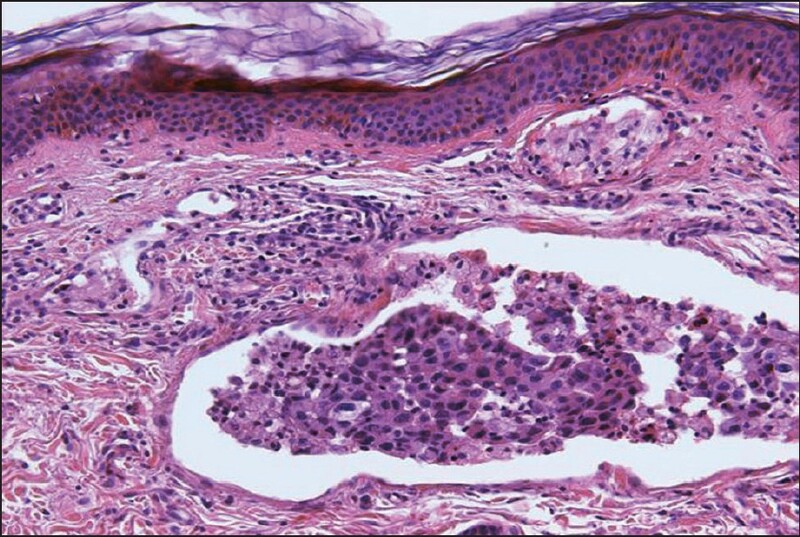 To our knowledge, there were no previous reports on cutaneous pancreatic metastasis in Egypt. 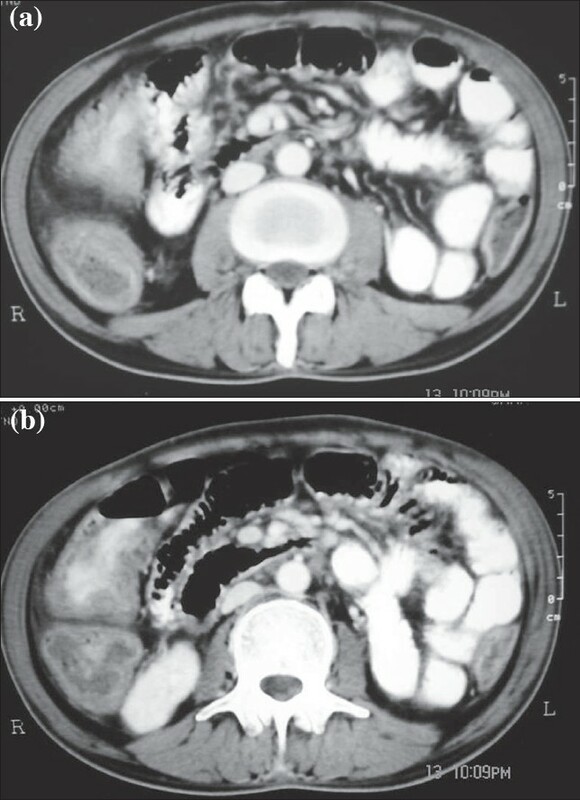 This is a report of a patient with cutaneous pancreatic metastases at the neck, followed by a review of reported non-umbilical cutaneous metastases from pancreatic carcinoma in the literature. Leptomeningeal metastases (LM) are most commonly observed in hematological malignancies. With prolonged survival in solid tumors, an increased frequency of metastases is noted in these tumors too. Early diagnosis, when the patient has minimal neurological disability, is associated with prolonged survival and improved functional outcome although the therapy is palliative. The diagnosis of LM is difficult, and the demonstration of tumor cells in the cerebrospinal fluid remains the gold standard. This can also be done by definitive neuroimaging. MRI is routinely used in this aspect. We discuss here a case where 18F-FDG PET/CT (Fluoro-de-oxy glucose positron emission tomography/computerized tomography) study helped us in the diagnosis of LM. Whole-body PET/CT imaging could be a useful tool in identifying the possibility of metastases of breast carcinoma in the usual sites and the not-so-usual sites of metastases. Extracranial spread of recurrent meningiomas involving the middle ear is rare. We present the case of a 59-year-old woman with headache and swelling of scalp over the right temporal region. MRI revealed a lesion in the right temporal lobe suggestive of meningioma. She underwent complete surgical excision of the lesion followed by post-operative radiotherapy. 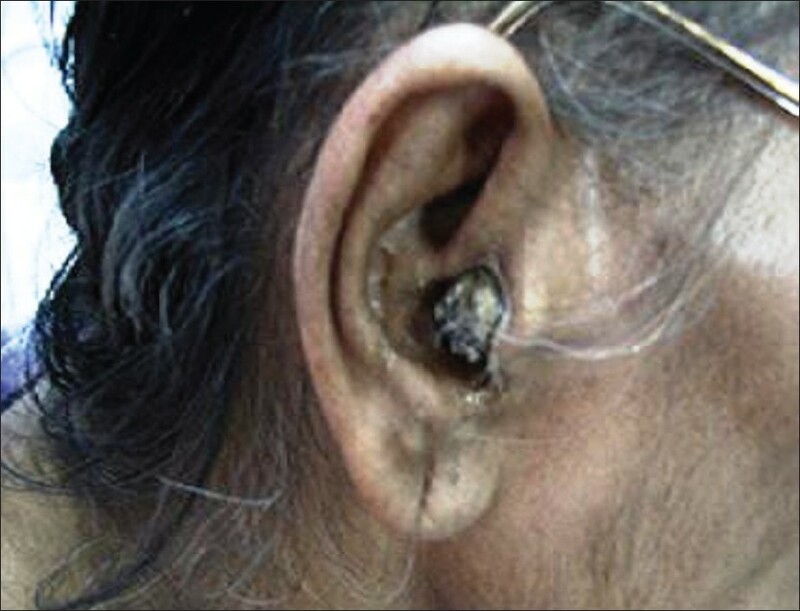 After 1 year, she presented with right-sided otalgia and a middle-ear mass extruding into the external auditory canal. She was re-operated and histopathology was anaplastic meningioma. We are discussing this unusual pattern of recurrence in our patient with a review of literature. We report a case of neutropenic enterocolitis diagnosed on computerized tomography abdomen in a 56-year-old man having high-grade non-Hodgkin's lymphoma. After appropriate management, the patient recovered completely.